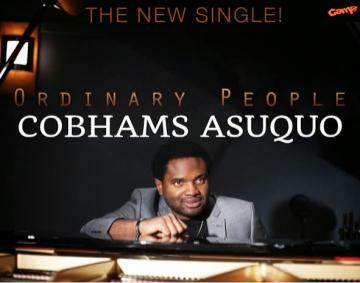 Out today is a brand new single from top Nigerian producer, singer & songwriter, Cobhams Asuquo. Cobhams ventured out from the producers’ seat and into the vocal booth in 2011, to put some of his most loved songs into an inspiring, uplifting self-published contemporary Christian album. The first single off the album is “Ordinary People”. Ordinary People is a testament to the latent power in the common man. In this song, Cobhams Asuquo calls to everyone to give to the best of their ability in the daily journey of life. This is a message delivered straight from the heart of one who knows; Cobhams was born blind and has achieved all he has by sheer determination, willpower and faith in God. Cobhams Asuquo (real name Cobhams Emmanuel Asuquo) is a Nigerian-born musician with an enviable track record in music production, songwriting, and singing. Previously signed to Sony/ATV UK publishing as a songwriter, Cobhams, is also the CEO of Cobhams Asuquo Music Production (CAMP); a music label and production company that serves as a home to popular Nigerian artiste/Glo Ambassador, Bez and Stan Iyke. He has also in his repetoire, extensive production work in the past 12 years for numerous notable recording artistes including Darey Art Alade, Timi Dakolo, Nikki Laoye, Rooftop Mcs, Asa, Bez, Banky W, Tiwa Savage, Waje and many more.